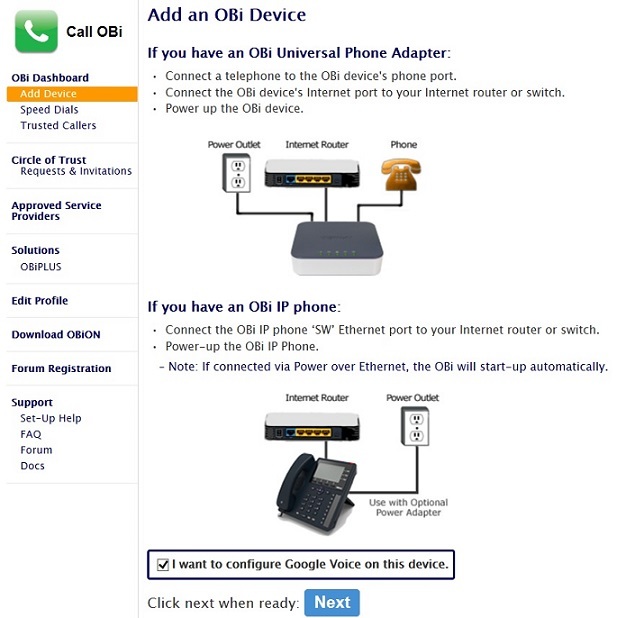 Obihai is a VoIP company from California that designs and manufactures Analog Telephone Adapters (ATA). 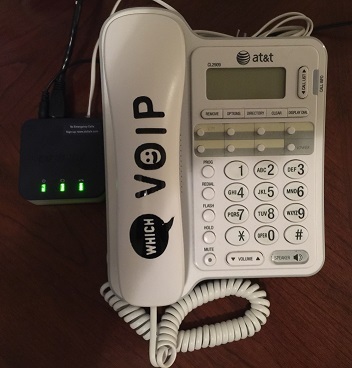 These devices turn a regular landline phone into a VoIP phone, and when connected to a VoIP provider, cheap phone calls can be achieved. To take this one step further, when the Obihai ATA is connected to Google Voice, you can make and receive calls inside the US and Canada free of charge. Intrigued? If so, read the following article and by the end of it you will be ready to say your goodbyes to all phone bills. Obihai makes Analog Telephone Adapters (ATA). An ATA is a device that takes your existing analog telephone and converts your voice to a digital format and sends it over your Internet connection (Cable, DSL, FiOS etc). This technology is referred to as Voice over IP, or simply VoIP, and because the calls are sent over the internet, it is much cheaper than traditional phone service. Figure 1 below shows a typical setup for your home, using the OBi200 as an example. The actual device is very small, less than 3 inches on each side, and has only 4 connections: power, internet, phone and USB, as seen in Figure 2. Now to Google voice, why is this required I hear you ask. Well, the Obihai ATA simply provides the hardware and software to make phone calls using your existing telephone, it does not handle the actual routing of phone calls to the PSTN, cell phones or indeed other VoIP lines. For this we need a VoIP service provider. The Obihai ATA can actually be used with most VoIP service providers, such as the ones you see in the table on the right hand side. These providers each offer low cost phone service with a rich feature set. Google Voice, however, is completely free and enables free phone calls inside the US and Canada along with low cost International calls. It was created by Google as a softphone to allow Google users to make free calls from a computer. Obihai was smart enough to realize that there were other ways to take advantage of this technology and allow users to make calls using traditional analog telephones. Obihai with Google Voice - What's the Catch? There really isn't a catch. Sure, you have to buy the Obi ATA device, which costs upwards of $40 for the base model. This is a one time fee, and Google Voice is completely free for calls inside the US and Canada. There is no official support from Google for this service. Google could tear this service at any time. In fact they nearly did before but decided to keep it going as part of its Google hangouts service. The feature set is very limited compared to the providers you see on the right hand side. Support wise, you are on your own. Hopefully this guide will help here though. Be careful with telephone numbers. If you are looking for a new number with a specific area code you may be out of luck, as there is not a huge selection to choose from. If you wish to port a number into google voice, at the present time this can only be performed with mobile phone numbers and be aware that currently there is a fee of $20 associated with this. You cannot port a landline number into google voice. If you need to port your Google voice number out of google it will cost you $3, at this time of writing. E911 calling. Google Voice does not support E911 emergency service calling. However, Obihai has a way around this, where you can partner with Anveo, for E911 service. There is a small fee associated with this, currently $15 per year. The setup for the OBi and Google Voice is not too difficult but there are a few steps that must be followed. First the hardware setup, Figure 3 shows my setup for the OBi200 device I used for this exercise. The only connections required were power to the OBi200, the phone line connection from the analog phone and the Ethernet cable that goes to my Internet router. No connection is needed for the USB, though this can be useful if you require WiFi (separate OBiWiFi adapter required). You will need a Google voice account. To get this you need a Google account (e.g. Gmail) before signing up for a Google voice account and phone number. Navigate to Google voice at http://www.google.com/voice and sign-in and follow the process to get a new phone number. A few verification steps will be required before you are given a new phone number. Now that Google voice is configured, it is time to sign up for OBiTalk. Register for an account and sign in with Google as it is easier, especially if you have already logged in to Google on your Internet browser. After creating an OBiTalk account and then signing in to OBiTalk, it is time to Add a Device. Usually this is the first thing that will appear when you sign in for the first time. You will be presented with some information on how to add a device, as highlighted in Figure 4 below. Remember to check the box for configuring Google voice for this device and click on Next. The setup will then give you instructions for the phone, as shown in Figure 5 below. This step is needed to connect the OBi device to the OBiTalk server. Note that the number you see in Figure 5 varies so follow the directions given for your own setup. I had some issues on this step and the OBi device would not connect successfully. I made the phone call and got the automated response but I got an error in OBiTalk. The problem turned out to be the ports that were configured in my router. Certain ports need to be forwarded in your router to the OBi device in order for a successful connection between the device and the Obihai servers. For more details on this, see our OBi200 Review page (Figures 3 and 4 on that page). Once I forwarded the ports in my router, I successfully connected my OBi device to the OBiTalk servers. Review the Emergency Services dialog box and then the Google Voice terms and conditions and then click on the "Finish Setup" button. You may need to sign in again to Google Voice with your email and password, from inside OBiTalk, and once you hit the final "Accept" button it will finalize the Google Voice setup. This can take up to 2 minutes, and will look like Figure 6 below while it is configuring. When it is done it will show "Connected" as the status. 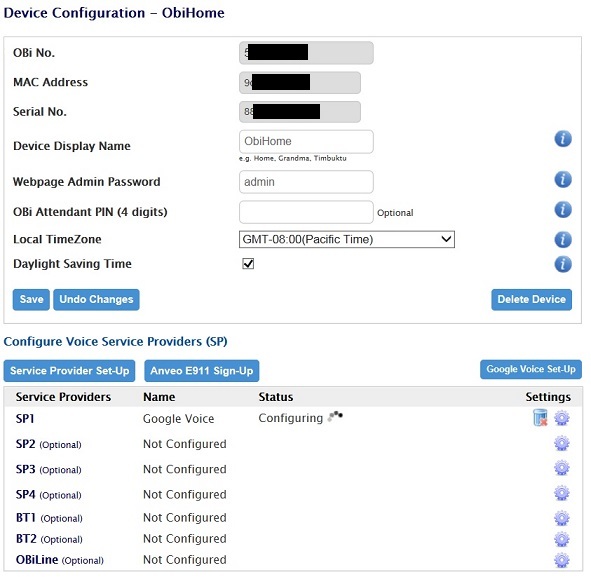 The OBi dashboard will now look like Figure 7, indicating that the OBi device is connected to the Obihai servers. You should be able to make and receive phone calls on your telephone now, and the best part is, they are all FREE! Google voice will work with any of the Obihai devices. Want to buy an OBi adapter? Amazon has great deals, see special deals below. Please add a comment at the bottom of this page if you found this useful or need help setting this up for free calls. Thank you for this helpful information. I am close to deciding to go with the OBi200 and Google Voice. You mentioned E911 service through Obihai partnered with Anveo. How is this done? -> Response: You can sign up for E911 through a provider such as Anveo and then configure it in the Obi portal to tell it you are using them. This is the best way as it will ensure the dial plan for E911 is set correctly. By the way you can usually test 911 service by calling 933 once you set up your address with the 911 provider. Note that Callcentric also does E911. Hello. I did all the steps for the set-up. Initially I had 10 cents on my Google Voice account and I was able to make a couple of outbound calls. The next day when I make an outbound call it's saying "You do not have enough credit to make this call." I thought it's supposed to be free. Is there something I missed? -> Response: Was it an International number you called? Those have costs associated with them. Can I turn off the answering machine part of Google Voice and use my own answering machine? -> Response: The only way I think you could do that would be to link a new number in Google voice so all calls go to that number, which would need to be attached to the answerphone. Good information and worked like a charm, all went well and without a hitch. I have been attempting to find information regarding the following: if you are talking on your home cordless phone that is hooked up to the OBi200 can you switch the call over, without interruption, to the computer and continue the call conversation? -> Response: Glad to hear it. Regarding your question, I don't think that is possible. You could try it when logged into Google voice and see if any option appears but I don't recall ever seeing such an option during the call. I currently have a Google Voice phone number and am using Google Voice to make phone calls from my computer. I get my internet in my home by WiFi Hotspot only. If I buy an OBi200 will it allow me to make and receive free domestic phone calls with my wired desktop phone set, Google voice account and my WiFi internet connection at home? -> Response: Yes that is the advantage of using Obi with Google voice, you can use a regular wired (or wireless phone) with your Google voice account. Just make sure it is the Obi2xx series as the old Obi1xx series will have issues with the latest Google voice platform. I have Google Home. Can Google Home interact with Google Voice for any additional benefits? Can I port over my phone number to Google Voice? -> Response: Indeed it can. In fact in many ways it works better than Amazon Alexa as it allows you to call anyone that is in your Google contacts list. Yes you can port your number over to Google voice, the cost is $20 at this current time. However there are restrictions on the type of numbers than can be ported. For example, cell phone numbers are fine but may be issues with landline numbers. See this url on the subject of google voice and porting numbers. I have an Obi100 from years ago, is it still usable? I have read elsewhere that it would not be after May 2017 (End of Life). I am having difficulty getting set up and wondering if it is that explanation or just errors I am making. -> Response: It is indeed EOL. Have you verified that you have the latest firmware on there? I would expect this device to still work in all honesty so it may either need a firmware update to the latest before it went EOL or perhaps you have an incorrect setting for your phone service. What is the cost per month for Obitalk? I live out in the country and have had Magic Jack for years. Service was choppy most of the time so I have chosen not to renew. Is Obitalk any better? -> Response: It may save you some money if you use the Obi adapter with Google voice but this assumes you can get a phone number from Google voice that works for you (few available now). However, if you had issues with MJ it may be due to your Internet in your location, in which case I'm not sure the Obi will help much to be honest. It may be worth running our VoIP test first.